There is something very fishy about these librarians. On a Saturday morning, drag queens Ida Kay, Blair St. Clair, and Halle Pino are reading the rainbow to a room full of children some stories. 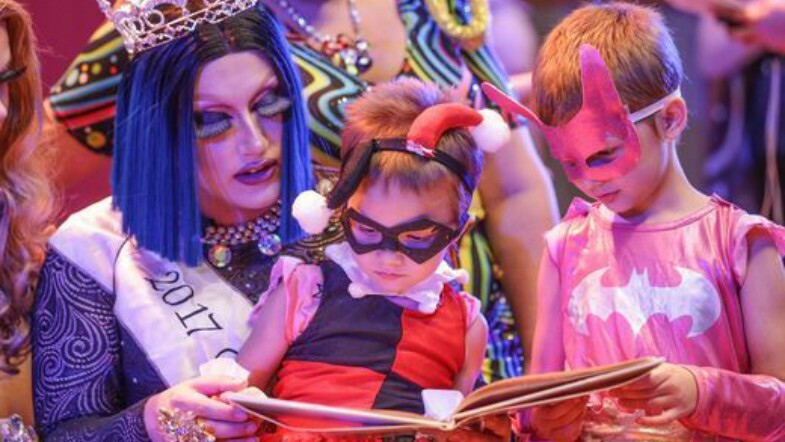 The event “Drag Queen Storytime” is hosted at Indianapolis Central Library. It has been newly added to their calendar since its start in June and has been a huge success. The most recent one held July 22nd was an encore of the first. Besides the reading, the library provided paper masks for the kids attending to decorate. By dressing up in costume and helping those in need, it can clearly be said that the Indy Bad Ladies are in fact America’s super heroes. They raised over 17,000 dollars on their 32nd Bus Tour in 2012. What do you think they are reading next? Tuck Everlasting?